We'd like to thank Charles St .Leger and Julia Taylor for conducting this interview on behalf of their son. Your son Joshua's new movie Maturing Youth - in a few words, what is it about, and what can you tell us about your character in it? Well, the story is about a young adult man named Roger, played by Sean A Kaufman [Sean A Kaufman interview - click here], having to grow up and take responsibility for his life. This comes about when an old girlfriend, Sadie played by Kim Paris, drops in out of the blue with his son, Junior, played by Joshua St. Leger. She departs, leaving Junior and well... that's when the paint hits the canvas! 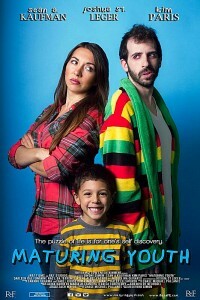 Now how did he get the role to begin with, and as parents, what were your major concerns regarding the shoot? Adn any special demands you had to make regarding your son's very young age? 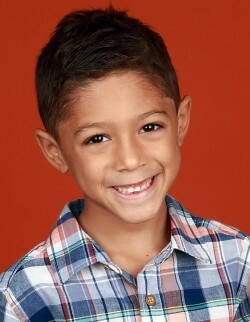 Joshua is a client of Nine 9 Agency in New York City and they booked him for the audition. We reported to R&F Entertainment Studios for the audition and he landed the part. Our only concern was any late evening shots on the set so as not to disrupt Joshua's sleeping schedule too much. How did you prepare Joshua for his role in Maturing Youth? We read to him the different scenes in the movie pertaining to his parts leading up to the shooting day and coached him on the set for his scenes. Divoni [Simon] wrote a great script and really communicated his vision for each scene. We really jelled when it came to Joshua's role and the great collaboration was evident on the final cut. We hope to have the opportunity to work with him on future projects. Very professional. Everyone had a job to do and everyone played their roles. It was all about getting the movie completed per director's directive one scene at a time. Everyone came with their "A" game on with the intention of creating an absolute classic. Based on his experience on Maturing Youth, is it likely that Joshua will make any more movies in the foreseeable future, or are there some already in store? Yes, in fact he has engaged in two projects since Maturing Youth; a college film project available on Vimeo and a children's music video for PBS. We are always probing the network for children roles and there's more to follow.